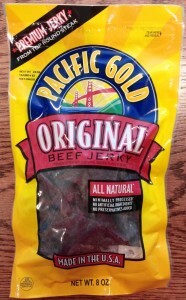 Today we’re openning up a bag of Pacific Gold Original Beef Jerky, picked up at the local Costco here in Frisco, Texas. Taste (B+): This is a sweet jerky that first greets you with a nice, and slightly fruity, brown sugar flavor. It’s a smooth sweetness complemented with a salty smoke flavor and a bit of garlic and pepper. It’s very well-balanced and the sweetness and spiciness combine nicely to both enhance and accompany the flavor of the quality pieces of premium beef. It’s genuinely tasty stuff! Texture (A-): These jerky pieces are naturally cut along the grain. It’s tender, but not particularly moist, so pieces bite off easily and chew with an enjoyably substantial feel. Smell (B): The jerky smells smokier than you’d think, based upon the taste. It has an almost sour note in its scent that’s definitely intriguing, but not especially enticing. You can make out a bit of the fruity scents, too, but most of all it’s the smoke. It smells good and is an inviting aspect of this treat. Appearance (A-): With large natural cut pieces sporting a dark brown color imbued with red in its depths, the jerky’s irregularly shaped pieces are real eye-candy. It looks like small-batch jerky from days gone by and is truly easy on the eyes. Consistency (A): This is an excellently prepared jerky. The pieces, despite their intentionally irregular size and shape, are expertly consistent in terms of their flavor, texture, and thickness. The fine folks at Oberto have really shown their skill here delivering a jerky that is tasty and enjoyable from beginning to end. 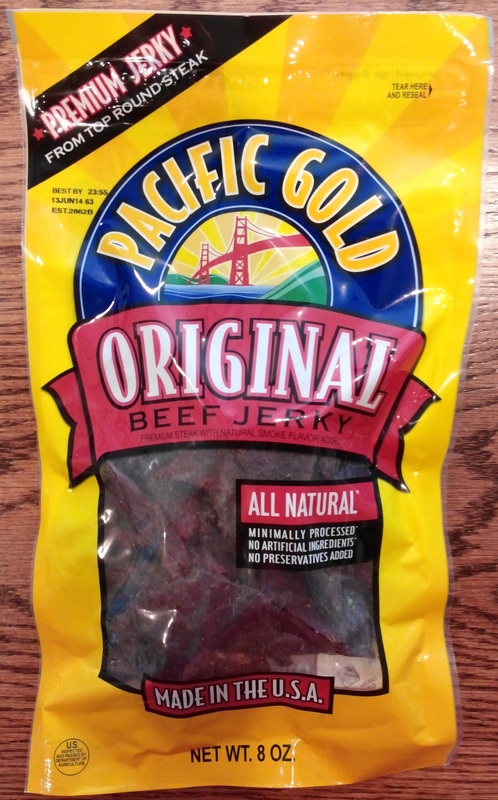 Overall Impression (B+): This is a very well made and genuinely tasty jerky. You’ll love its complex sweetness and the fantastically well-match spices that complement it. It eats well and is just a real treat waiting to be enjoyed. On your next trek to your local Costco take a look to see if they have some of this delicious beef jerky and pick yourself up a few bags. You’ll be glad you did. Eat well! Tagged beef, original, salty, smoked, sweet. Bookmark the permalink.